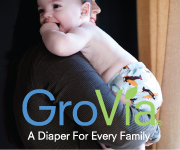 The makers of Gro Baby have rebranded and are now called “GroVia.” This rebranding has come with improvements to their orginal diaper, the Gro Baby, which now boasts better sizing and laundry tab loops. They have also launched a new diaper, a side snapping All in One, which I have had the opportunity to review. I have already reviewed the older versions of the Gro Baby with Aplix and Snaps, and have to say I prefer the snaps. So, I expected to like this diaper very much. This is also special since this is my 55th video review, and my very first video review was of the Gro Baby with Aplix. That diaper inspired me to do what I do today! Ease of Use ✰✰✰✰ There are only 4 snaps to affix with this (and most) side snaping diapers. You have the ability to snap in closer, or farther from the baby’s thighs depending on the size. The stretchy tabs make it very easy to get a perfect fit around their legs, reducing a chance of leaks. There is no fuss when it comes time to wash the diaper. The soaker can stay on, and the booster can be unsnapped or not, so far leaving it snapped hasn’t caused any trouble for me. If you are worried about the snap coming undone, unspap before washing. No stuffing required! Bang for the Buck ✰✰✰✰ The AIO retails for 21.95, which is a great place to be in the AIO organic cotton range. Still pricer than most pockets, but AIO,s are usually more expensive. The nice thing is that you can just buy a few for convenience sake and have pockets or AI2’s make up the majority of your stash. It is just great to have a few AIO’s for trips out etc. I do love the look and feel of the PUL, which is what attracted me to Gro Baby when it first came out. Performance ✰✰✰✰ So far this diaper has been leak free for me. There is no stay dry liner which reduces the risk of any repelling, though it can still happen. Any urine is going to instanty soak in. The snap in booster helps greatly in absorbency, and the tight fit around the leg has prevented any leg leaks, especially for a side sleeping napper. Overall- I LOVE the way this diaper looks on. It has a nice sleek look due to the sie snaps, and the Gro Via AIO’s have matching snap colors, something the Gro Baby were lacking. Especially since Gro Via have larger snaps than most brands, this is a welcome improvement. The snaps are super strong as well. In general, I like AIO’s and pockets more than AI2’s so I am happy to have the Gro Via style diaper in this version. I am sure other people are the same and will buy the AIO before the AI2. I do miss the cute leaf logo of the Gro Baby, but like the placement of this tag much better.This brand is always coming up with something so I can’t wait to see what is next! This diaper was sent courtesy of Gro Via for the purposes of this review. All opinions expressed are 100% my own.